The California Department of Food and Agriculture and the USDA National Agriculture Statistics Service compile data by grape pricing district annually in the California Grape Crush Report. The report includes information on tons of grapes crushed by variety and base price paid to growers. 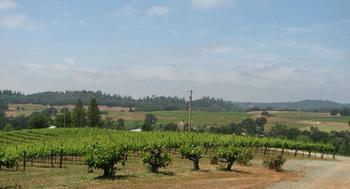 Wine grape acreage constitutes the largest agricultural commodity produced in the foothills, other than timber. 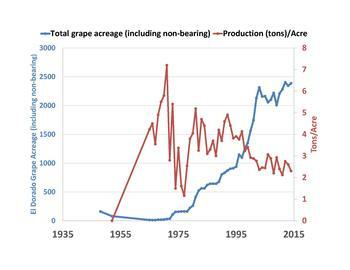 Foothill wine grape acreage has generally increased over time, while tons/acre produced has declined, most likely due to viticultural practices and varieties grown. 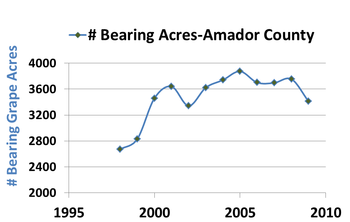 Wine grape acreage in El Dorado and Amador Counties. Data from County Agricultural Commissioner's Crop Reports. Learn more about grape varieties on the UC Integrated Viticulture grape varieties page.